The WOO is able to detect and score well-performed tricks! 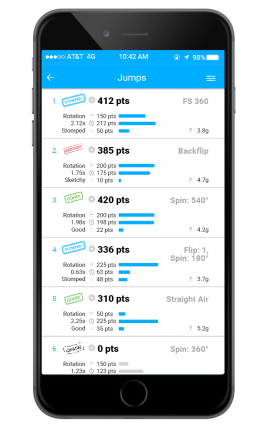 Trick score is dependent on the trick variation, airtime, and landing quality (not landing G-force). Check below to see which tricks the WOO can already recognize. Set your stance in the WOO Sports App and the WOO knows if you did a trick in your normal stance (Regular / Goofy), or if you did it switch (SW). Switch tricks get a bonus score of +50 points. The more the merrier! Help us teach the WOO new tricks simply by riding! Contact support@woosports.com for more details on the best practices in training WOO. The WOO is able to detect normal from Hardway rotation tricks. As Hardway tricks are more difficult, your score will get a bonus score +50 points for Hardway tricks. The WOO can detect & score the following tricks. A bigger jump gives you a higher airtime score (e.g 1.00s = +100pts). Your landing quality will also give you a bonus score, ranging from max. +50pts for a Stomped landing to a +10pts for a Sketchy landing. If your trick is not detected by the WOO, it will show as 'Trick' and you'll still get a score based on your rotation data. You can label the jump to confirm / deny the Trick Detection in the WOO Sports App for iOS, doing so will let the Trick Detection learn new tricks and get even better at detecting known tricks. *Note: Scores are subject to change. WOO will contineously improve the scoring system in order to balance trick difficulty vs jump size. WOO is adding even more details to your jump table in future app releases, including SW vs. Regular, rotation direction, and trick name for specific tricks the WOO has learned to identify. Want to help teach the WOO tricks? Join the WOO Crew Ambassador Program this year!